Located on the top floor, Room 17 is an ocean facing room. This room features two windows, one with a unobstructed beautiful view of the beach and ocean. 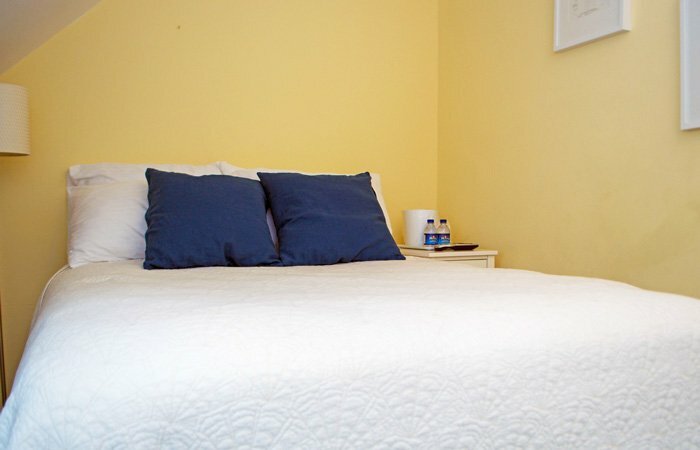 The room can be adjoined with Room 19 (which has a full bed) for a family or group accommodations. While the shower and toilets are down the hall on the same floor, the sink and vanity are within the room for your convenience. 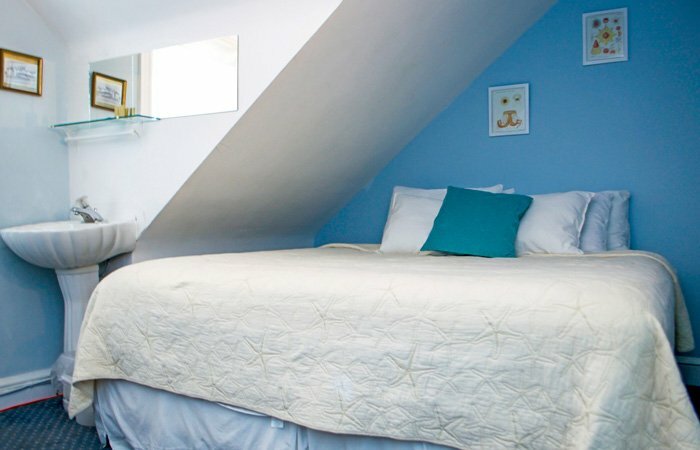 Room 17 is painted a clean white and is fitted with rustic furnishings, seaside inspired bedding, pillow top mattresses, plenty of pillows, Cable TV, AC, coffee provisions, and environmentally-friendly, paraben free Earth Tempo toiletries. Located on the top floor, Room 18 is an ocean facing room with a queen. This room features two windows, one with a unobstructed beautiful view of the beach and ocean. The room can be adjoined with Room 20 (which has a full bed) for a family or group accommodations. While the shower and toilets are down the hall on the same floor, the sink and vanity are within the room for your convenience. 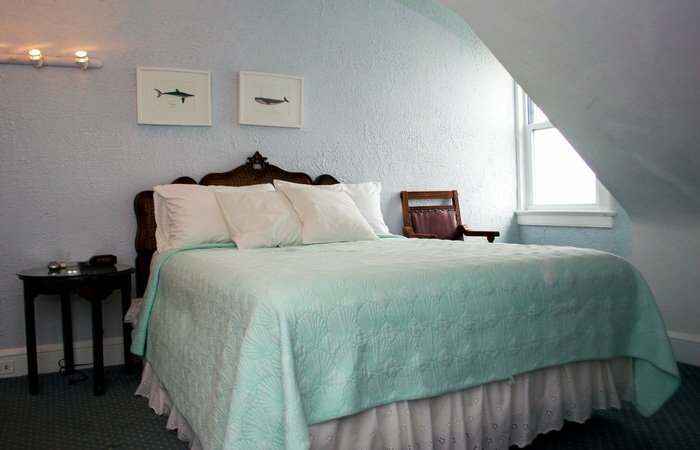 Room 18 is painted a clean white and is fitted with rustic furnishings, seaside inspired bedding, pillow top mattresses, plenty of pillows, Cable TV, AC, coffee provisions, and environmentally-friendly, paraben free Earth Tempo toiletries. Located on the top floor, Room 19 is one of our more quaint rooms. It's perfect for our guests traveling alone or for our couples who don't mind sharing a smaller space. The room can be adjoined with Room 17 (which has two twin beds) for a family or group accommodations. While the shower and toilets are down the hall on the same floor, the sink and vanity are within the room for your convenience. 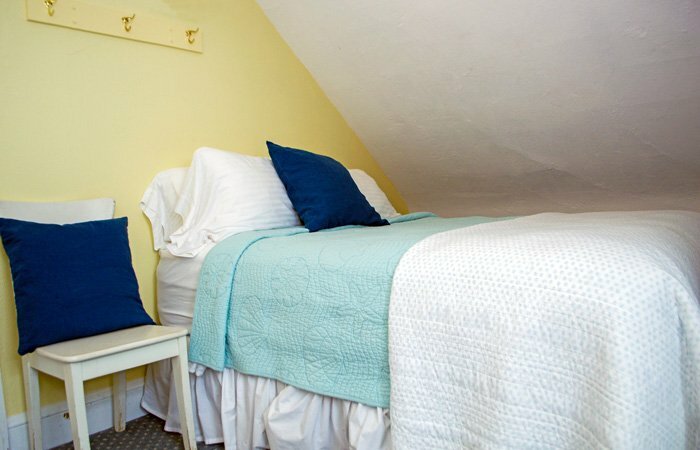 Room 19 is painted a sunny yellow and is fitted with rustic furnishings, seaside inspired bedding, pillow top mattresses, plenty of pillows, Cable TV, AC, coffee provisions, and environmentally-friendly, paraben free Earth Tempo toiletries. Located on the top floor, Room 20 is one of our more quaint rooms. It's perfect for our guests traveling alone or for our couples who don't mind sharing a smaller space. The room can be adjoined with Room 18 (which has a queen bed) for a family or group accommodations. While the shower and toilets are down the hall on the same floor, the sink and vanity are within the room for your convenience. 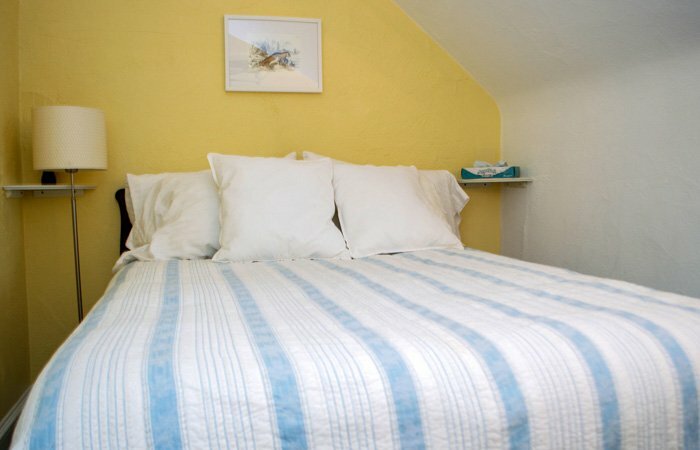 Room 20 is painted a sunny yellow and is fitted with rustic furnishings, seaside inspired bedding, pillow top mattresses, plenty of pillows, Cable TV, AC, coffee provisions, and environmentally-friendly, paraben free Earth Tempo toiletries. Located on the top floor, this room features two windows with partial ocean views to the south. It is the largest room on the floor; our only room on the Shared Bathroom Floor with a king bed. While the shower and toilets are down the hall on the same floor, the sink and vanity are within the room for your convenience. 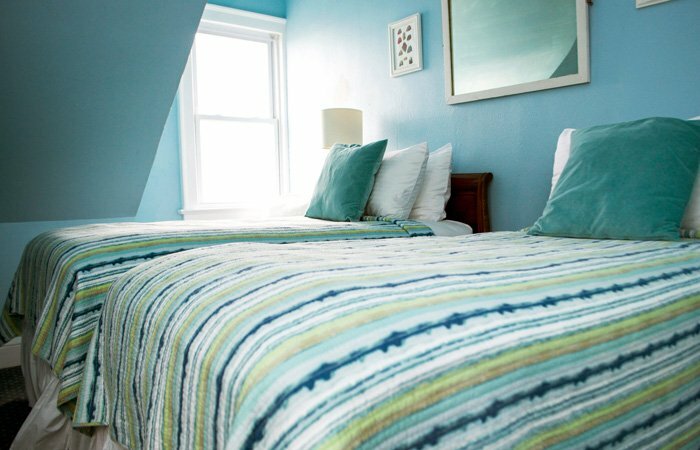 Room 22 is painted soft blue and clean white. It is fitted with rustic furnishings, seaside inspired bedding, pillow top mattresses, plenty of pillows, Cable TV, AC, coffee provisions, and environmentally-friendly, paraben free Earth Tempo toiletries. 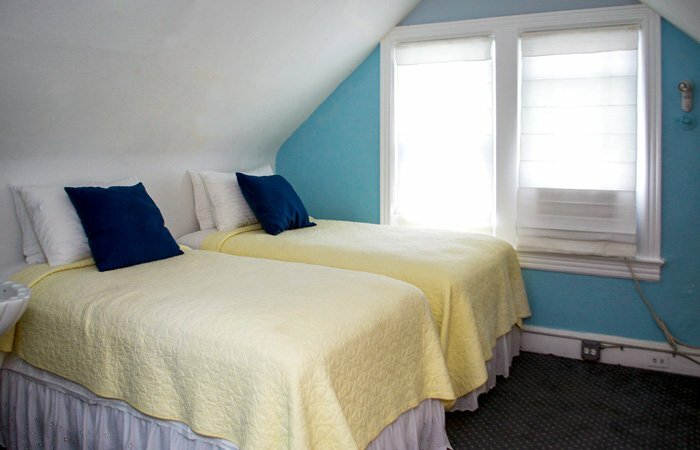 Located on the third floor, this double twin room is great for guests who want a little extra space. It features two windows with partial ocean views to the north side. While the shower and toilets are located on the same floor down the hall, a sink and vanity are within the room for your convenience. Room 23 is within close proximity the tub room and a toilet room. Room 23 is painted clean white and soft blue. The room is fitted with rustic furnishings, seaside inspired bedding, pillow top mattresses, plenty of pillows, Cable TV, AC, coffee provisions, and environmentally-friendly, paraben free Earth Tempo toiletries. Located on the top floor, room 24 is one of our more quaint rooms in the house. It's perfect for our guests traveling alone or for couples who don't mind sharing a smaller space. This room features a window overlooking our yard. While shower and toilets are located on the same floor, a sink and vanity are within the room for your convenience. Room 24 is within proximity to the tub room and a toilet room. 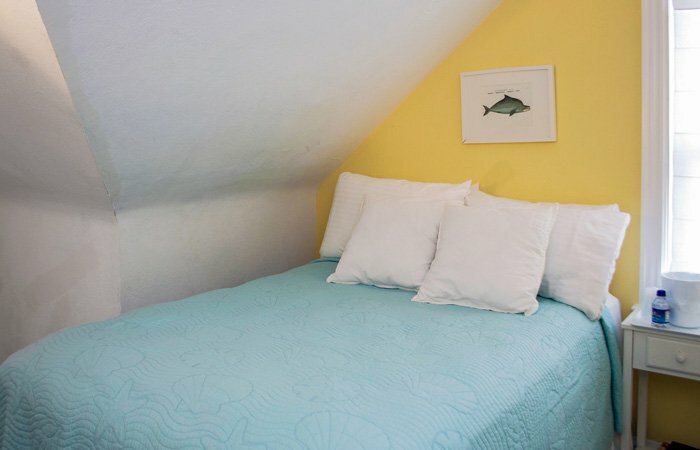 Room 24 is painted a sunny yellow and is fitted with rustic furnishings, seaside inspired bedding, pillow top mattresses, plenty of pillows, Cable TV, AC, coffee provisions, and environmentally-friendly, paraben free Earth Tempo toiletries. Located on the second floor, room 25 is one of our more quaint rooms in the house. It's perfect for our guests traveling alone or for couples who don't mind sharing a smaller space. This room features windows overlooking our side and back yard. While shower and toilets are located on the same floor, a sink and vanity are within the room for your convenience. Room 25 is within proximity to the tub room and a toilet room. Room 25 is painted a sunny yellow and clean white. It is fitted with rustic furnishings, seaside inspired bedding, pillow top mattresses, plenty of pillows, Cable TV, AC, coffee provisions, and environmentally-friendly, paraben free Earth Tempo toiletries.